This unbelievably cute intarsia cat will get your kid noticed! In fact, it's a pretty quick knit―and once you have the cat chart completed, the rest is simple and plain sailing. The cat's body is knit into the sweater, with the eyes, nose, whiskers and outlining added in duplicate stitch afterward. Perfect as shown for Halloween, you could also use other colors to customize it for different holidays or use a child's favorite colors to make it a year-round sweater. The sample shown has a picot bind off at the neck as a little embellishment; for boys a regular bind off is fine. Small amounts of medium weight yarn in pink, green and light grey for face and outline (we used Caron Simply Soft in shade 0015 Strawberry, Red Heart Soft Yarn in shade 4420 Guacamole, and Caron Simply Soft in shade 9742 Grey Heather). With straight needles, cast on 62 (66, 66, 70, 70, 74) stitches in the main color. Establish 2x2 rib on Row 1: K1, *K2, P2. Repeat from * to last stitch, K1. Work 1.5 inches in 2x2 rib. Change to Stockinette Stitch and work until piece measures 15 (15.5, 16, 16.5, 17, 17.5) inches. 4 years and 6 years only, increase 1 stitch at each end on first Stockinette row. 62 (66, 68, 70, 72, 74) stitches. Transfer live stitches to a holder. Work as for back until piece measures 2 (2, 2.5, 2.5, 3, 3) inches, ending with a wrong side row. K6 (8, 8, 10, 10, 12) place marker, begin Basic Outline Chart at Row 1 and work the 50 chart stitches as shown, place marker, K6 (8, 8, 10, 10, 12). When you have completed the chart, continue working in Stockinette Stitch in the main color for another 1 (1.5, 1.5, 2, 2, 2,5) inches, ending with a wrong side row. Shape neck: K23 (25, 25, 26, 26, 27) put remaining stitches on a holder, and turn work, continuing to work the stitches on the left front. Continuing in Stockinette Stitch, decrease 1 stitch at neck edge on every right side row 4 (5, 5, 5, 5, 5) times. Work in Stockinette Stitch without further shaping until piece measures 15 (15.5, 16, 16.5, 17, 17.5) inches. Leave remaining 19 (20, 20, 21, 21, 22) stitches on a holder. Cut yarn, leaving a tail. Leaving center 16 (16, 18, 18, 20, 20) stitches on the holder, rejoin the yarn on the right side and knit the 23 (25, 25, 26, 26, 27) at right neck. Leave remaining 19 (20, 20, 21, 21, 22) stitches on a holder. With size 7 US (4.5 mm) needles and main color, cast on 38 (42, 42, 42, 46, 46) stitches. Work 1.5 inches in 2x2 rib, ending with a right side row. Continue to work in Stockinette Stitch, increasing at either end of every fourth row 4 (4, 4, 5, 5, 6) times and then every sixth row 4 (5, 6, 6, 6, 6) times until there are 54 (60, 62, 64, 68, 70) stitches. Work straight until piece measures 9.5 (10, 11, 11.5, 12, 12.5) inches, ending with a wrong side row. Using Detailed Cat Chart, work the cat's eyes, nose, whiskers, and outline in duplicate stitch. Place the back and front together, with wrong sides facing out. 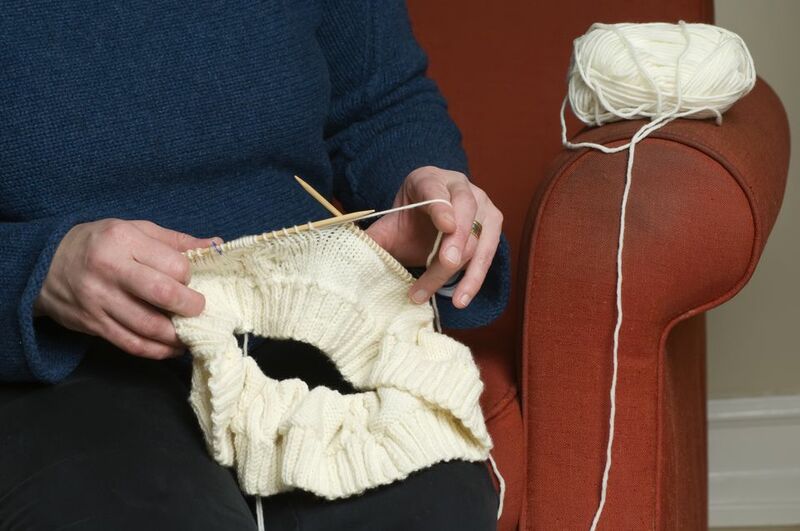 Join shoulder seams using the 3 needle bind off. Fold sleeves in half lengthwise and pin into place, with the center of sleeve at shoulder seam. Sew the side and sleeve seams. With the circular needle, pick up and knit 10 (11, 11, 11, 11, 11) stitches down left front of neck, knit the 16 (16, 18, 18, 20, 20) stitches from the holder at front neck, pick up and knit 10 (11, 11, 11, 11, 11) stitches up right front of neck, and knit the 24 (26, 28, 28, 30, 30) stitches from the back. There are 60 (64, 68, 68, 72, 72) stitches. Place marker and join in the round. Work in 2x2 ribbing for 1 (1, 1, 1.5, 1.5, 1.5) inches. For a girl: join contrast color yarn and work Picot Bind Off. For a boy: join contrast color yarn and knit one round, then bind off loosely in rib. Weave in ends end then block sweater to schematic measurements; take particular care with the cat motif to even out any tight or loose stitches.